Today I bring you two victims, both with the same mistake. As you can see, this is very much not Arabic, but Hebrew. However, this is not "Forgiveness" either. Forgiveness, in Hebrew, is Slicha. There is also a multiple form (forgivenesses?) Slichot. This particular Hebrew tattoo says neither. It says Slichoch which isn't a real word and just sounds funny. This tattoo is not only misspelled - says the meaningless non-word Slichch, but it's real ugly too. By the way, it also means sorry, which I bet these people really are. Yes. It does mean sorry in Hebrew, but in the "forgive me" sense, not "I regret". 'Those are pretty sorry tattoos' completes Typo's trinity of clever alternate 'sorry's. This semi-slang use in english is how I'd translate מםכן (mees'chen'), meaning pathetic, sad, or miserable. The upper victim's 'artist' needs to learn to say 'I'm sorry' in Arabic. 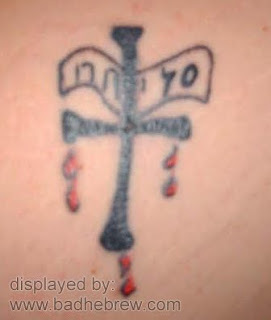 And the cross dripping blood? Oy, forgive them for they know not what they ink. are you sure the top one wasn't trying to write "ninja" using Hebrew letters? For forgiveness I would use the hebrew "mechila" (מחילה), to avoid confusion with the more mundane "slicha". Slichot (plural) is the name of prayers you say to repent before Rosh Hashana and is not used for forgiveness. Just noting the weird dot above the Lamed in the first one. @x: You can use Slichot in mundane speech, for example, the common apologetic expression "Alfei Slichot" (thousands apologies). As for Mechila, yes, you're right about that. Mechila? Are you guys serious? The first thing that comes to my mind when I see this word is a tunnel. any chance that the last letter in the 2nd picture is supposed to be a tet? Still spelled wrong, but at least it's getting phonetically closer. Under a microsoft microscope the last letter is revealed to be a 'Mem soffit'... and 'Sally' to be, despite her illiteracy, suprisingly 'Hot'. The girl who thought she was getting a tattoo in Arabic and instead got it in Hebrew- when do Arabs ever ask for forgiveness for their endless murders of innocents around the world? It would be a nice idea if they began asking for forgiveness. Oh well. 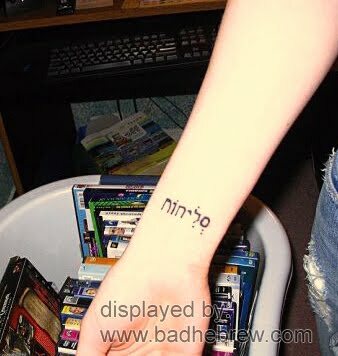 In order to fix the tattoo that she does have with the least amount of pain, the ח HET at the end of the word (the last letter on the LEFT SIDE of the word) could be changed into a ת TUVF and the word would become slichot which would pluralize it to mean the time when forgiveness of sins is asked during the period of prayers before the Jewish High holidays. By the way, the tradition of "throwing ones sins into the river"- a symbolic act is done on a specific day. Many observant Jews were saved because that was the day that the Arabs chose to blow up the Twin Towers and these Jews took the morning off to say this prayer at a river bank or by the ocean. Tashlikh (Hebrew: תשליך‎, meaning "casting off") is a long-standing Jewish practice usually performed on the afternoon of Rosh Hashanah, the Jewish New Year, however it can be said up until Hoshana Rabbah. The previous year's sins are symbolically "cast off" by throwing pieces of bread, or a similar food item, into a large, natural body of flowing water (such as a river, lake, sea or ocean). It bring shivers up my spine just now as I remember how evil it was the Arabs attacked Israel in 1973 on Yom Kippur. Such an evil and cruel act, but in fact this barbaric act saved many Israeli lives because people could be contacted easily because everyone was at synagogue. Not everyone had phones back then and of course there were no cell phones. No need to talk politics here. Not all Arabs are the same. Forgiveness should be better translated into "מחילה" than "סליחה". As a traditional Jew, I liken tattoos as a defilement of the body, and they remind me of the numbered tattoos on concentration camp inmates. I think using such a special, holy language as Hebrew for is blasphemous and totally disgusting. Agreed. It seems alost "Oxy-Moronic" if that is a word. I think it's the point that what they want to mean about the sign. Is if for showing forgiveness or something else. But it is really awesome if they want to show the sign of forgiveness there. Can you plz see the crazy video goo.gl/KIZRf of forgiveness. How important it is for our health that we learn how to forgive.